Cacoon Tent – hanging tent is safe and strong and iconic. Its high quality, weather-proof fabric resists all the elements. Treat yourself to a playhouse in a trees. It’s small enough to carry, yet big enough to share. From wind and wet to sun and sea, its high quality, weather-proof fabric resists all the elements. It’s been tested and hung in every type of environment – in the garden, on a hike, in the woods, by the coast, in the office, in sports and leisure centres, in bedrooms and dens, in hotels and adventure playgrounds – inside and out, just hanging out and giving people a lot of fun. The Cacoon Tent – Hanging tent was designed by a team of professional sail makers and experts in fabric and textile technology for architectural structures. It was originally commissioned as a relaxation solution for the UK’s Scarlet hotel to complement the coastal location and eco-aspirations of this luxury spa in Cornwall. The Cacoon tent is safe and strong, simple yet quirky. It’s small enough to carry, yet big enough to share. From wind and wet to sun and sea, its high quality, weather-proof fabric resists all the elements. It’s been tested and hung in every type of environment – in the garden, on a hike, in the woods, by the coast, in the office, in sports and leisure centres, in bedrooms and dens, in hotels and adventure playgrounds – inside and out, just hanging out and giving people a lot of fun. The Cacoon Tent is one of the leisure industry’s newest and most interesting innovations. The hanging tent is set to become the must-have! 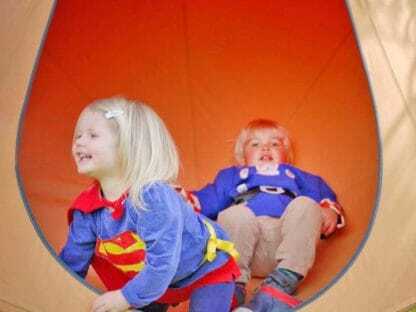 At 1.5m, the single Cacoon Tent – Hanging tent is our most popular size, inside or out – just perfect for the single adult ‘escape’ or for the kids: is it a tent, a chair or a Tardis? A den or a tree house? A wigwam or a Wendy House? At 1.8m, the double Cacoon Hanging Tent is for two adults stretched out or blissed out! And if the kids must… imagine a joey in a kangaroo’s pouch – now see your kids in a Cacoon. Throw in a couple of teddies and… heaven! At 1.2m is the latest addition to the Hang-in-out Cacoon family. Hang-in-out makes two stands for their Cacoons. A wooden Cacoon stand and a Metal Cacoon stand. We make a wooden swing stand that was designed with the Cacoon in mind. See the Orchard swing, at 3m x3m and 2.6m high this stand will take the Cacoons size and weight limit. It will also take a standard swing seat and other styles of swings giving you a dual purpose swing frame. 1. Lay the Cacoon flat on the ground with the door spread open. 2. Take the rods and assemble the inner ring by slotting together the sections piece by piece whilst feeding them through the guide loops on the inside of your Cacoon. 3. Once you’ve fed the sections through all the loops, complete the rest of the ring. You may need to use a little force to align and slot together the last two sections. 4. Pull the front of your Cacoon over the completed ring – using your hands and fingers to lever the final part of the fabric over the ring (the design of your Cacoon relies on the ring fitting tightly – so be prepared to use a little force). 5. Using bow knots, secure the last parts of the inner ring to the horizontal seam with the ties provided. 6. Hang your Cacoon – but before you do, check the branch, beam or bracket is strong enough to take both your weight and that of any friends who may join you. 7. Lie back and enjoy you slice of relaxation. You can machine wash the fabric on a cold cycle (no bleach). Put the ring back into your Cacoon and hang dry (do not tumble dry). It’s important you don’t dry without the ring in place or it may lose its shape. And don’t even think about getting the iron out – Cacoons don’t like irons they also do not need ironing! Or, if you prefer (and can’t wait before trying it out), simply wash your Cacoon down while it’s hanging – outside, obviously. Use warm soapy water before rinsing off with clean water. You can hang your Cacoon from any point 2.5m above the ground that has 1.5m space from the nearest vertical surface. Or, buy one of our beautiful tripods or our Orchard wooden swing frame. The wooden swing frame we make is designed with the Cacoon in mind. You can sleep in a Cacoon Tent. You can add a door if you want one and also an insect net. Both of these fit over the top of the Cacoon and slide around the outside.